ARC received at no charge to facilitate review. To an eleven-year-old explorer named Martin, not much can top finding a frozen giant egg. Who cares if bullies taunt him and he disappoints his father because of his lack of interest in football? At least he has his egg to care for in his makeshift lab in his barn. As long as he has his outdoor world in Menominee Springs, Wisconsin to explore and such fabulous finds, he is perfectly content. Martin becomes the proud owner of what he thinks is a deformed lizard that hatches from the egg when it finally thaws. He's always wanted a pet but never expected his new lizard turns out to be a real dinosaur. The Tyrannasaurus Rex, Martin names Rufus, quickly attaches to his new owner. 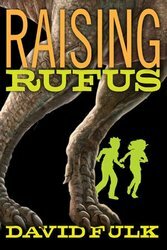 While Martin takes on summer work to feed Rufus, he finds himself in over his head when he can't keep up with the ever growing appetite of his pet dinosaur. Even with the help of his new friend, Audrey, Martin can't keep his secret hidden. Together they race to keep Rufus from ending up as a freak side show in the town's theme park but in doing so, will Martin have to give up the pet he has come to love? In his debut novel, Fulk keeps the reader laughing while tugging at the heartstrings in his coming of age tale. Any boy who has ever loved his pet won't be able to put the book down until he finds out what happens to Rufus. A delightful take on an age-old dilemma of love and loss.